Accuweigh recently installed an industrial checkweigher to grade 20kg bags of lime at Unimin’s Tamaree plant in Queensland. Supplied by Accuweigh/Budpak’s QWM branch in Brisbane, the industrial checkweigher was configured for static weighing operation and certified for trade use. Static weighing eliminates the need for random samples to be removed from the conveyor line and weighed on a separate set of trade approved scales to ensure conformance to Weights & Measures regulations. Each bag is conveyed to the end-of-line checkweigher where elevating bars lift the bag off the rollers for weighing. 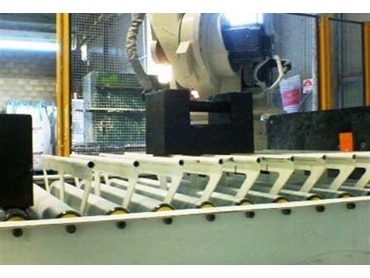 The acquired static weight reading is then transmitted to the robotic palletiser. Based on the weight readings, the correct weight bags are palletised for despatch and out of tolerance bags are stacked onto a rejects pallet. Manufactured in Australia, Accuweigh’s AccuCheck industrial checkweighers use locally available weighing components to ensure parts and serviceability availability well into the future. Accuweigh/Budpak, Australia’s leading weigh/packaging group operates eight branches across all mainland states for all forms of weighing and packaging equipment.